A great but small vintage partial page original magazine ad. Ad measures approximately: 2 3/4" x 4". Condition: EXCELLENT. 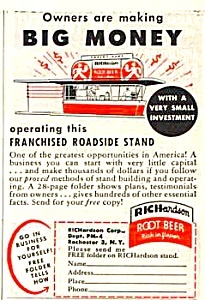 Owners are Making Big Money Operating this Franchised Roadside Stand (in 1950!). Certificate of Authenticity is provided to show that this piece is from an original magazine (not a copy).